Will this stand hold a single 75" display? BEST ANSWER: This stand uses VESA standard mounts with patterns up to 600x400. 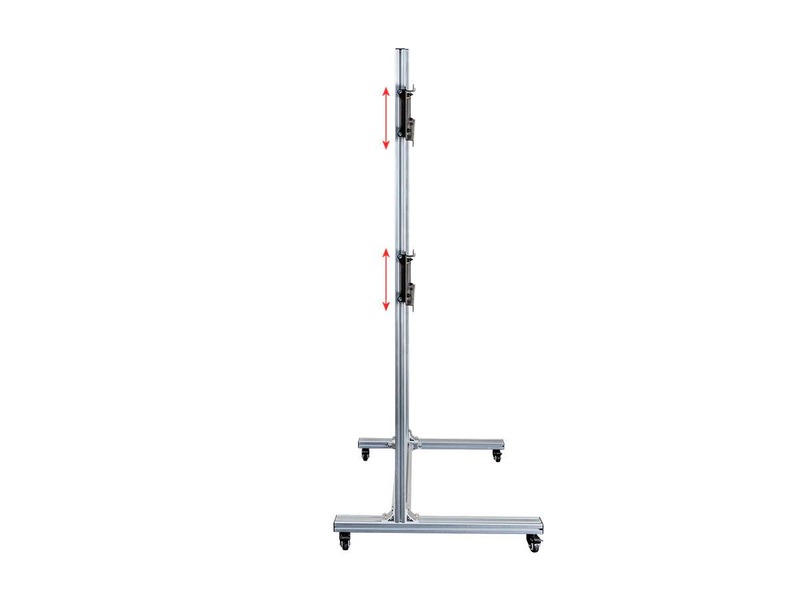 If the mounting pattern on your display matches these standards the stand will easily support a single 75". The distance to the outside of the uprights is about 48". A typical 75" monitor is 65" wide. I have two of these units and find them very well made and quite stable. I'm looking for a easy way to mount 2x2 42" screens on an actual wall. Spending time to level and align 4 or even 2 mounts would be better served elsewhere. Is it possible to remove the rolling base of this product and mount the vertical brackets to wall? BEST ANSWER: You’d potentially need to mount the vertical silver braced to the wall possibly. I’d say your idea is possible but would require some fabrication to keep the screens level and square so it depends on your comfort with fabricating a solution. The black cross braces that hold the screens are designed to slide on channels down the silver, silver vertical structures so it’s not going to be a simple process. Yes, it can be mounted on the wall as standalone, and would help you reduce the videowall installation. BEST ANSWER: My gut says no, that is not a good plan. Please look at out Menu Board mounts. These are designed and have instructions to help you cleanly mount your screens separately with no gaps in any configuration you want. I just recently purchased this and built it in my garage on the stand as I wanted it to be mobile. To your question, the cross bars are standard size and have 2 sets of holes drilled (4 each side) which could be used to connect them to the wall. As the diagram suggests they are ~48 inches apart. It might be difficult to hook the bar directly to the wall and mount to the studs. In the event you do, you would only be able to use two bolts per side but that should be more than enough. The issue you will run into has to do with the pieces that connect to the TV's. Those are not low profile. Two of the three adjustment knobs point directly back and would likely prevent you from mounting the TV's if the bars were flush. To see what I am talking about, look at the "Diagram" PDF. If I were looking to mount these to a wall and not the stand, I would first mount some 1 x 8 boards to the wall first, then the bars to those boards. The cross bars are 200 mm high and a 1 x 8 is ~184 MM high. Sorry to be long winded, hope this helped. Good luck to you. I could not be happier with my stand. Great product. what size of tv's can I put on this? BEST ANSWER: These will fit as large as four 55" displays, and can work with four smaller 40" displays. How deep is this product? BEST ANSWER: Hello, The bottom of the cart is 810mm long, and the vertical post rests 465mm inwards from the front of the base. 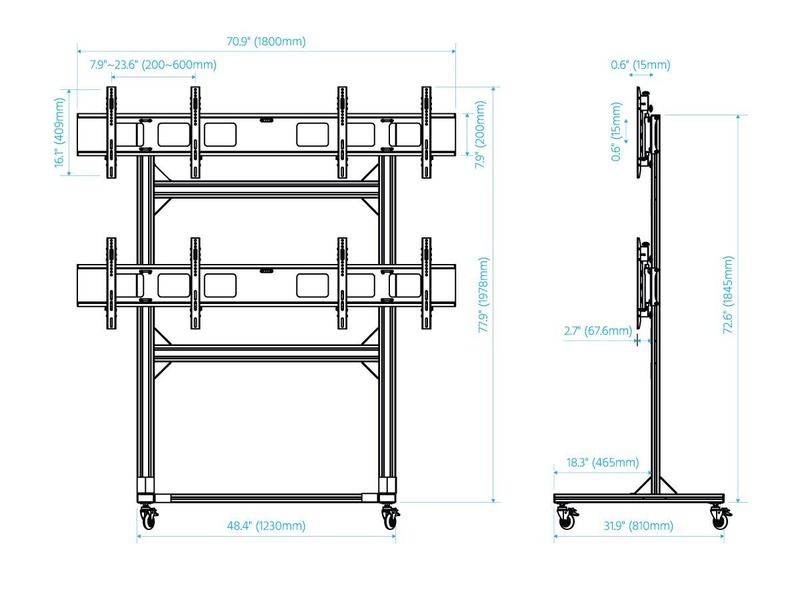 If you would like a full detailed drawing of the cart, please feel ree to reach out to tech@monoprice.com. I hope this information helps. Can I set the TVs vertically also? use more of a 3x1 display and does all the mounting brackets come with the purchase? BEST ANSWER: You can mount monitors vertically. All brackets and a generous assortment of mounting screws and spacers are included. This is a professional grade product. I have purchased two this year and am extremely impressed with the quality. Can this be used without the casters? BEST ANSWER: Yes. If you not put the casters on, it is flush to the ground. 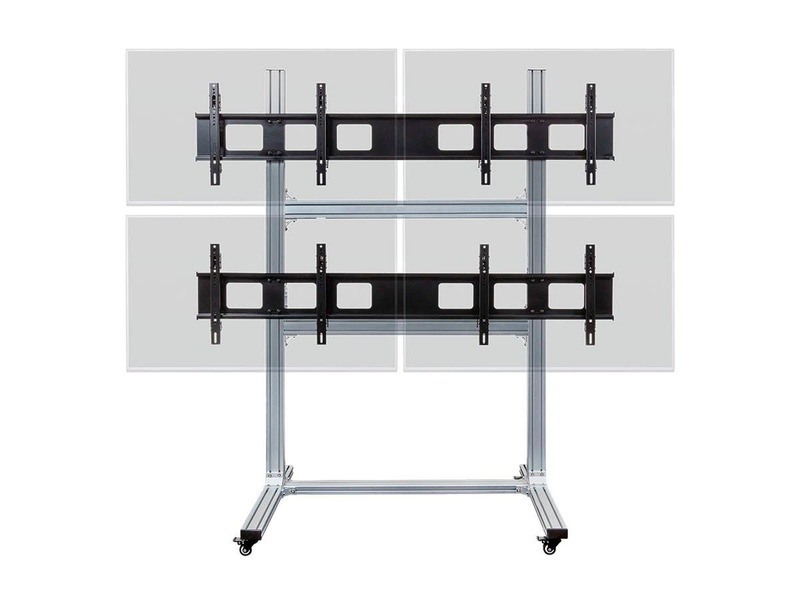 do you offer a simular product to hold 4 x 65" TV's? BEST ANSWER: Not yet. If this one does well we will add larger models. How tall is the post that holds the TV? What is the height of the lower portion of the stand? I have a fireplace I would want to stand under the tv’s. This product overall is good but found some flaws in the design and construction that can make it challenging to use. First off the special nuts provided to assemble most of the pieces together are low quality and the inside threads are easily broken. Second issue I had was using it with 55" TVs are very difficult because the micro-adjustments knobs are actually rubbing the aluminum columns. Third issue is related to the tire holders they got broken after very light use. It seems the tire holders are not designed to support the weight is intended with 4 55" TVs (TCL). So far... Almost perfect... just wish it was taller. It is almost exactly what I had expected. 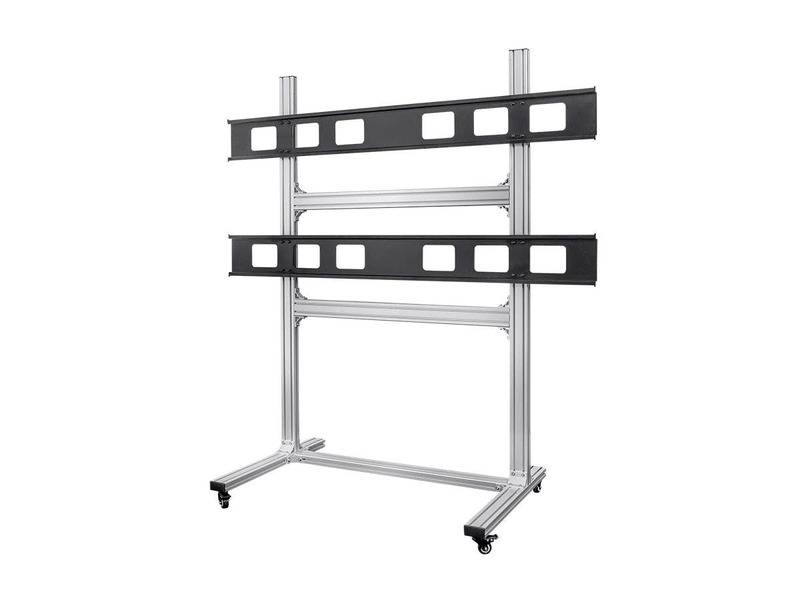 Sturdy, well made, it rolls easily, it will take the 55" screens I wanted it to in the first place as and an added benefit it will easily hold my single 80" screens with a nice strong stand. The reason for the 4 stars, and is that the stand will be a little short for how i plan to use it. I didn't really think about it before, but the bottom of the lower pair of screens will be less than 3 feet from the floor. I am planing using this for exhibition and displays. so if someone i standing in front of it, the screen will be almost completely blocked. The vertical or upright pieces are only 6' tall, if they were just 8 feet tall it would make a huge difference. I am going to search to see if can find he same extrusion and get two 8' pieces. If Monoprice could help in that regard it would be awesome. I have converted my 2 car garage into a man cave for watching sports, drinking, and playing darts. I needed a solution to allow for TV's that would allow me to use my attic access door. Even the low profile mounts would put the TV's in a dangerous proximity especially for when you would move things too and from the attic. This solution allows me to simply unplug one power cable (a separate power strip I added) and roll it out of the way. Easy to build and a very sturdy product. This is a great solution. Lots of additional adjustments so you can make it line up just the way you want it. 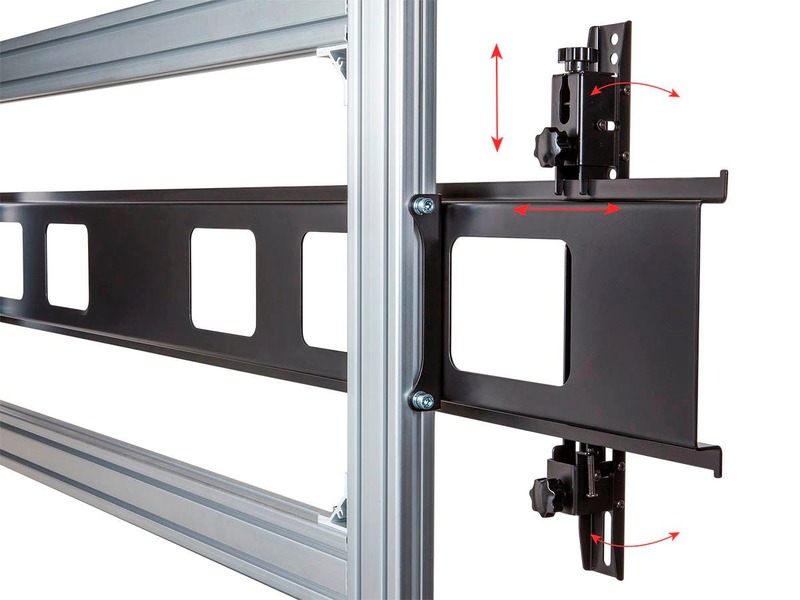 Very well engineered product that allow infinite adjustment of screens to insure proper alignment. If you are building a 2x2 screen system this is the mount I would recommend. Fast free shipping was a Bonus. As an educator I'm always seeking new ways to present information. 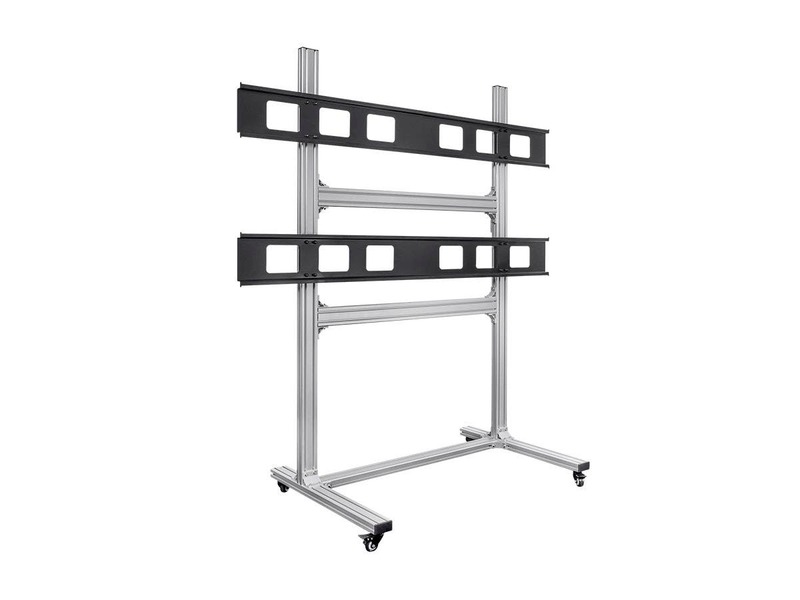 The 2x2 Wall Display Cart provided me with a professional grade product that I use with four 55" monitors creating an impressive video wall. The mobility of the cart allows me to move it throughout the facility. The Monoprice package included everything I needed to mount the displays - screws, spacers and even a small level. I was so impressed with the quality I purchased a second unit. This stand looks great and works really well. Can't be beat for the money! Can't be beat for the money. Rolling video wall is sweet!